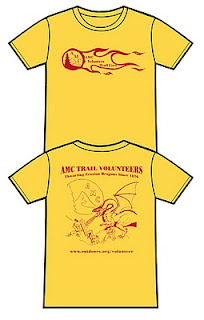 Jill Sternberg, a volunteer with the Mohican Volunteer Trail Crew, submitted the winning design for the 2010 AMC Volunteer Trail Crew T-shirt. Her unique line drawing is a great representation of the AMC Trails Programs and the value of our Volunteers. Jill's design will be printed on a large number of our T-shirts for the 2010 season for AMC Trail Volunteers from the Delaware Vally to northern Maine. 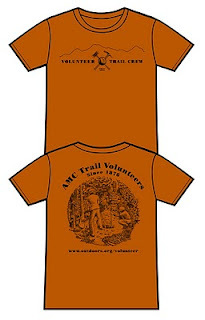 Of all the years we have been producing the Volunteer Trail Crew T-shirts, this will be the first time we have run a burnt orange shirt with black ink, this is a great color choice that Jill had recommended to complement her design. We will be running a second T-shirt design for the 2010 season, one designed with our Teen Trail Crews in mind. At the end of our week-long volunteer trail crews our volunteers complete a program evaluation in which they get an opportunity to comment on the T-shirt design. For a few years now different individuals have commented the T-shirt needed "More Dragons!" Ask, and you shall receive. We are all looking forward to a great 2010 field season in the Delaware Water Gap, Berkshires, White Mountains, Maine and all of our other Volunteer Trail Crew locations. Want to get your hands on one of these T-shirts? Sign up today! Take a look at the Full 2010 Schedules of our One to Four Week Volunteer Trail Crews or our One to Three Day Work Parties.